While many twins claim to share a special telepathic bond with each other, identical twins Linda and Terry Jamison are the only ones to be described as "psychic twins" in the world today. They are the only psychics who publicly predicted the attacks of 9/11 and are nationally known as spiritual counselors and experts regarding world-event psychic predictions. Linda and Terry are the daughters of the well-known watercolorist, Philip Jamison and his wife, Jane. They also have an older brother who has not, to date, demonstrated any psychic abilities. The twins grew up and went to school in West Chester, Pennsylvania. Their childhood was plagued by numerous illnesses, but the two girls shared a special bond early in their lives. In their own words, they considered themselves bifurcated souls - parts of the same soul inhabiting two bodies. After high school graduation, they attended Temple University where both girls majored in fine arts. Early careers included stints as performance artists, comics and models. They founded a performing arts company and performed across the country, including a special appearance at the White House for President and Mrs. Regan. The twins are still recognized as the comic character "Louise the two-headed homemaker" from Saturday Night Live. Today, the two women live in L.A. and maintain a counseling practice for individuals and businesses. They have appeared on over sixty shows on prime-time and cable networks, including Oprah and the Tyra Banks Show. Moreover, they are considered experts in the area of world predictions - something they have been doing since the 1990s. The twins claim they are the most accurate of psychics and point to their long track record. Critics counter and point to some of their predictions being rather vague and general, such as an escalation of terror attacks, an increase in deadly hurricanes, the nuclear threat of North Korea, etc since all of these have been escalating over the last decade. Others point to the twins' 2017 and 2018 predictions for innovations in technology and medical breakthroughs, yet didn't give any specific breakthroughs, such as a cure for a specific disease or a specific technology. Critics argue that technological advances and medical breakthroughs happen all the time. However, some of their predictions that came true seem to be very specific. Practicing Buddhists, the twins individually pursue automatic writing as a way of tapping into the Akashic Records, believed to be part of the universal consciousness in which every thought, deed and action of the universe is stored for reference by souls evolved enough to access them. Terry and Linda maintain a popular website Psychic Twins.com and post informational updates about their professional media appearances on Facebook and My Space. They also have a YouTube channel where you can catch up on their latest predictions. The twins are popular among celebrities and fans. They conduct readings for celebrities. They post the videos and podcasts on their YouTube channel. In addition, they conduct a lot of celebrity predictions that are posted with updates on their accuracy. Respect for both women as professional psychics is hard won. Both have legitimized their work by successfully helping police solve murder cases, locate missing persons and reunite families. Immediately following 9/11 though, the FBI shut down the twin's website and any other website that mentioned their predictions. Even they endured a period time where they faced the red glare of the government spotlight and a country wounded to the core by the tragic events folding around them. Both Terry and Linda believe in reincarnation and that they have led past lives as extra-terrestrials. Listening to them talk, the uncanny twin factor reveals itself. They both finish each other's sentences, or overlap and speak in unison. They see their purpose on earth as one to educate and elevate those who come looking for guidance. Both women maintain a set of ethical principles from which they run their business. They are currently the only psychics allowed to advertise in the bitingly sardonic magazine Skeptic whose mission it is to debunk any claims of psychic powers or paranormal happenings on whatever level. 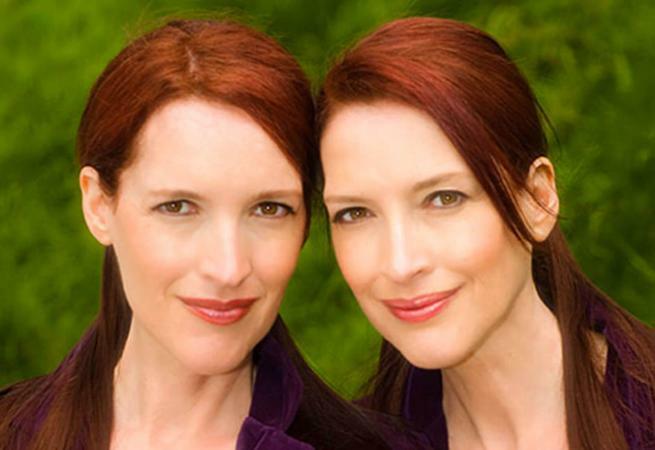 The Psychic Twins are authors of the book Separated at Earth: The Story of the Psychic Twins. They also produced a meditative, reflective CD called Twin Hearts. The CD's purpose is to assist people looking for better love relationships and soul mate connections. Their work as practicing, professional psychics has taken the twins around the world and won them numerous legions of fans who have great respect for their collective body of predictions over the past twenty-five years. It is clear that psychic twins Linda and Terry Jamison have a unique bond that transcends the average twin connection. These renowned psychics clearly reveal their inner selves through their work and their mission.